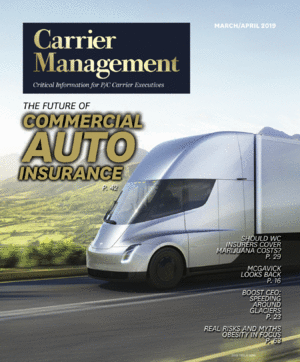 One of Nationwide’s commercial insurance policyholders is realizing the benefits of venture-capital investment that the insurer made in a telematics startup and a pilot program that is reducing risky driving behaviors by 70 percent. The policyholder, HASC Center, a nonprofit agency that provides transportation services for children with developmental disabilities, among other services, had of its 20 fleet vehicles drivers participate in a 16-week program that involved dashcam monitoring of driving behavior. The provider of the dashcams was Nexar, a computer vision-based telematics startup, which is one of several startups backed by Nationwide Ventures. In August 2017, Nationwide announced its commitment to invest $100 million in customer-centric solutions that help members, in several ways, including living comfortably in retirement, protecting digital assets and protecting them in the evolving area of mobility. In January 2018, Nexar announced that it had raised a $30 million round of new funding from Nationwide Insurance and other investors to help expand the reach of its technology. Nexar is a telematics startup focused on building the world’s largest safe-driving network. The video-recording technology provides vehicle-to-vehicle communication that connects directly to a dashcam app and monitors driving behavior. Nationwide notes that the success of the pilot program with HASC Center is an example of how the close partnership between the insurer’s innovation team and legacy business groups can help customers. During the HASC Center pilot, dashcams monitored over 3,000 hours of fleet vehicle operation of the 20 participating vehicles, and more than 20,000 miles of mostly city travel. A followup survey of the pilot showed that 78 percent of fleet managers indicated that dashcam technology had a positive or very positive impact on driver behavior, and 67 percent of drivers reported that they were comfortable with dashcam technology present in their vehicle. In addition to the Nexar partnership, Nationwide’s venture capital team has made 11 investments to date, including Betterview, a machine learning InsurTech startup that focuses on capturing and analyzing data from drones, satellite and other aerial imagery, Next Insurance, a digital agency turned digital carrier that focuses on small and medium sized businesses with coverages that now include commercial auto, as well as BlueVine (small business funding), blooom (401K management), Insurify (a virtual car insurance agent), Matic (a homeowners insurance agent working with lenders and servicers), and Sure (on-demand renters, pet, baggage and other insurance). In June, Nationwide announced its plans to open a new innovation center in the Arena District near its Columbus-based headquarters, scheduled to open in 2019.